There is pressure (often unspoken) to be normal. Nobody wants to be “out of the ordinary”. Our current bullying epidemic is evidence of this. Never before has there been more pressure on our children and young people to fit in. The rise of the internet troll (hiding behind their keyboards saying things they’d never dare to say were they to be held accountable for their words), has created the illusion that it is our right to comment on the appearance, beliefs, politics, attitudes and behaviours of others. There is little to no regard for the impact this may have. And so, we see examples of increasingly young people taking drastic action to escape the barrage of abuse. This frightens me. Not only because it is tragic, but because in my experience young children are the most accepting of differences. On many occasions, I have found myself reassuring a parent that their child will be safe in an educational environment because their peers are quite willing to accept that everyone is different and that’s how life is. At what age does this attitude change? When do we stop seeing different, unique and special as a positive thing? 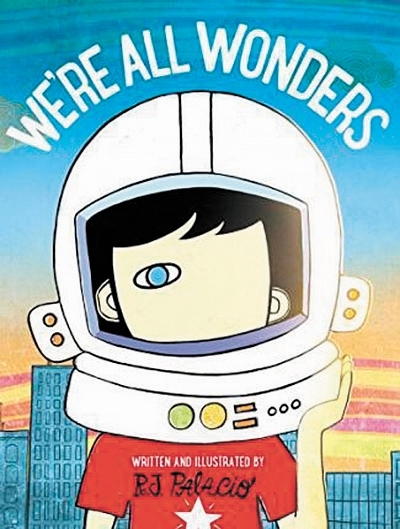 A spin-off of the children’s novel Wonder (adapted last year into a feature film starring Julia Roberts), We’re All Wonders explores the experiences of August Pullman, “an ordinary boy with an extraordinary face”. Auggie’s facial deformities are referred to only briefly, and the illustrations are simple, allowing readers to bring their own interpretations based on their personal experiences. The main focus of the book is Auggie’s explanation of how he knows he is different and how he copes with this. The most poignant page is where Auggie says: “I just don’t look ordinary. I don’t look like other kids.” This text is accompanied by an illustration of 10 “other” children, all of whom look different. However, Auggie knows that when people see his differences, their perceptions are accompanied by negative comments. Auggie shows us his maturity by explaining his coping strategies and approaching the situation with hope – strategies and attitudes that can be adopted by each of us.